Kenbeyil Ordabayevich was born in 1962 in the city of Zhezkazgan, Karaganda region. 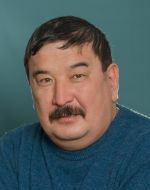 He graduated from the Karaganda Polytechnic Institute named after K.Satpayev in 1985, specializing in “Mining Engineer”. In the same year he was employed to No.55 shaft of the West Zhezkazgan mine as an underground mining master. In 1990 he was transferred as the Head of the No.67 shaft of South Zhezkazgan mine, since 1992 he worked as the Head of the shaft. In 1994 he was appointed the Chief of No. 65 shaft of the South Zhezkazgan mine. Since 1997 he had worked as the First Deputy General Director of the Zhezkent mining processing plant. In 1999 he was the Manager of the “Vostokkazmed” branch of the “Kazakhmys” Corporation. In 2006 he was appointed as a Regional Director for the East Kazakhstan region of “Kazakhmys” Corporation. In 2007 he was transferred to the position of Deputy General Director of the "Kazakhmys" Corporation for mining works. In 2014 he was invited to LLC “Bakyrchik Mining Venture” as a Deputy General Director for production. On January 5, 2018 he was appointed to the position of Technical Director of LLC “Bakyrchik Mining Venture”.